Do you remember how nervous you got before the start of school year? Many of us had family trips or a shopping spree for new outfits to help ease the nerves. For some, this is out of the question and can be difficult to even get the basic necessities like a backpack or school supplies. Every year the Children's Fund of San Mateo Countyopens a new window collects new backpacks and school supplies donated generously from people in the community, like you, to help foster and low-income children prepare for a new school year. Last year, with your help, the Children's Fund was able to distribute over 27,000 items to over 730 children in need. 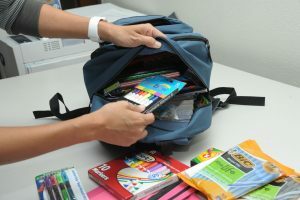 San Mateo County Libraries is again supporting this worthwhile cause and we need your continued help to exceed the goal of providing backpacks and supplies to 800 students. Let's help every child feel equally prepared and give them the basic tools they'll need to thrive. Drop off your backpacks and school supplies at these participating San Mateo County Libraries by Thursday, July 5th, 2018. All donations are tax deductible and receipts are available upon request. If you can't make it into the library to donate items, you can also conveniently shop on Amazon right from the Children's Fund's Wish Listopens a new window! Thank you for helping us make an impact in our community!